SaintFrancisDam.com HS7067 | St. Francis Dam Disaster | SoCal Edison Saugus Substation After the Flood, March 1928. 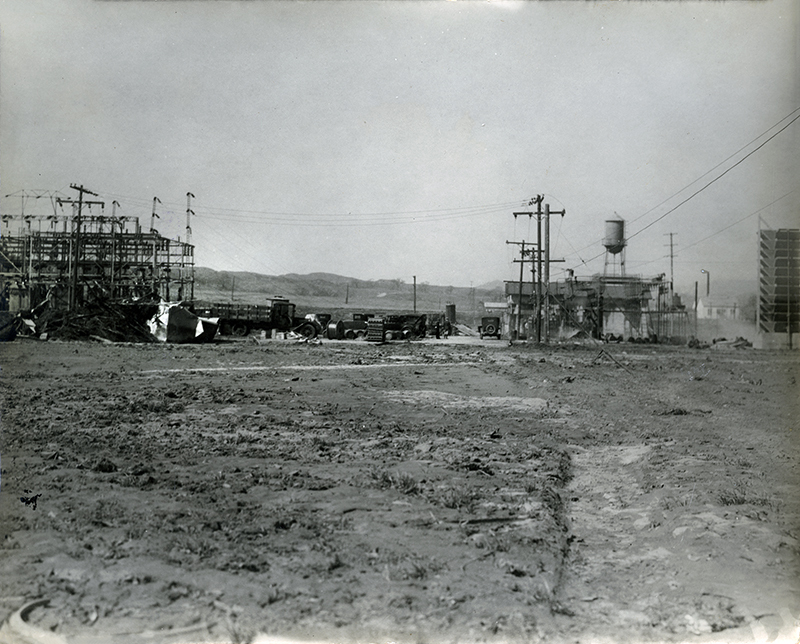 Southern California Edison's Saugus Substation in the aftermath of the 1928 St. Francis Dam Disaster. The substation was built between August 1923 and August 1924 on the south/west side of today's Magic Mountain Parkway in what is now Valencia. It replaced the smaller 1899 Castaic Substation. The night crew at the Saugus Substation "didn't need a wake-up call," historian John Wilkman writes, when the St. Francis Dam failed just before midnight on March 12. "They were startled into action when an oil switch exploded, setting off a fire. ... Something had gone terribly wrong and no one was sure what caused it" (Wilkman 2016:94). We heard a roaring noise which at first we thought was a train on the tracks near the highway. We soon realized ... that a large volume of water was running down the Santa Clara River. ... One of the Big Creek lines flashed over and lit up the entire country, showing us that water was already across the highway (ibid.:97). Several small buildings at the substation were destroyed, among them some of the Edison workers' cottages, as "a thick layer of sand, gravel and debris ... pushed south over the Santa Clara River channel" (Hundley & Jackson 2015:144). The substation was inundated and the transformer yard was littered with debris — as seen at left in the photograph above. HS7067: 9600 dpi jpeg from original 8x10 glossy print, SCV Historical Society collection. Stamped imprint on back indicates it was donated by Thomas E. McNeill of Valencia.